Bedrooms: 2 "Plus 2 Additional Rooms in Addition"
Comfortable 1996 Mobile Home with an addition allows you some flexible space when needed. Original part of home offers 2 bedrooms and 1 bathroom but the addition allows for a guest bedroom or office/den, plus 2 piece bathroom, plus enclosed 11 x 9 storage room that could also serve as small bedroom for visiting grandchildren. Main living space has an open plan with a corner Gas Fireplace that is both pleasing to the eye and practical because it has a fan that circulates the heat when needed. Living room has large windows for lots of light and both the Kitchen & Main bathroom have skylights in the vaulted ceilings. Natural Gas Heat, Central Air and electric Hot Water Tank installed in 2016. Kitchen is very functional with lots of counter-space, a dishwasher and pass through to the combined living & dining areas. Wide, easy to manage front steps lead to the front door via a 9 x 20 covered deck. There's an 8 x 12 storage shed tucked behind the attached carport that can handle 2 cars parked in tandem. Acacia Court is a 55+, no pet park with only 12 units. Located just barely outside the Village of Keremeos limits. Pad rent is $312. 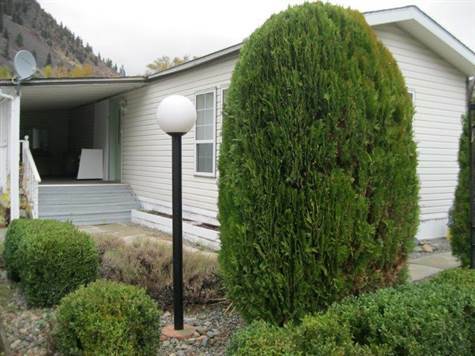 If you're craving an easier lifestyle; want to be able to 'lock up and travel'; want to live in a small, friendly community just 30 minutes from Penticton & Osoyoos, check out this Keremeos home.